Ah, Tartiflette... Never has happiness been so fully contained within such a short, odd-sounding word! The queen of winter dishes, it never fails to serve up a heart-warming feast in grey weather, or even not, elsewhere. Those in the know never pass up the opportunity to enjoy a good home-made Tartiflette! 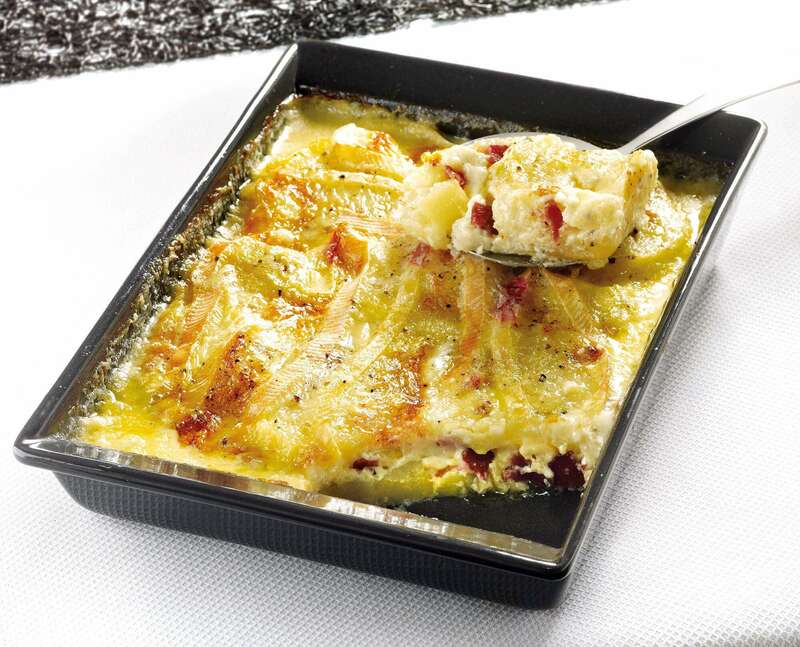 An iconic recipe of the Savoy region, Tartiflette epitomises togetherness and sharing. It has also transcended genres, moving from home kitchens to free-ride, becoming the mascot of various winter sports… There’s no denying it, there’s nothing better than a good, hearty meal at the end of a day of hard physical activity out on the slopes! But contrary to what you may think, Tartiflette, or at least its name, has not always formed part of Savoyard folklore! In fact, the name “Tartiflette” dates back to the 80s. Savoyard restaurateurs put the dish back on the menu, renaming it. Tartiflette, which gets its name from the “Tartifla” Savoyard potato, was actually inspired by a traditional dish called La Péla. What’s the difference between them? The cooking method, and the addition of a splash of white wine! La Péla was cooked in a large pan with a long handle that looked like a spade, hence its name. It was cooked in the hearth or a communal bread oven when one was lit. It must be said that oven-baked Tartiflette is a little more practical! What ingredients are needed for a good Tartiflette? Where does Reblochon come from? Why? How? So, which ingredients are needed to make a real, authentic Tartiflette? What is the recipe for a traditional Tartiflette? Well, we’re going to tell you everything you need to know about it. Let’s start off with the basis of the recipe, without which Tartiflette just wouldn’t be Tartiflette… Ladies and Gentlemen, we ask you to put your hands together to applaud the Almighty Reblochon de Savoie! 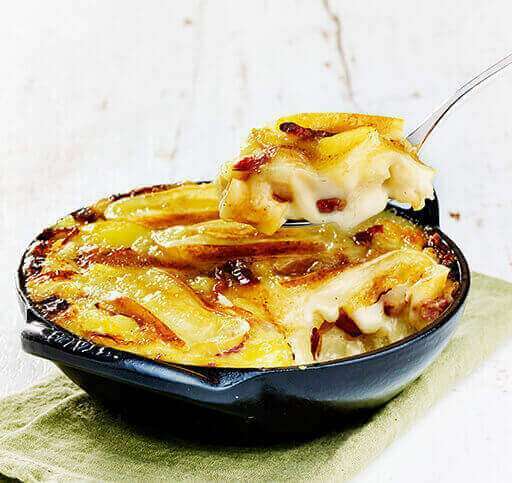 Without this iconic cheese… no recipe and… without a recipe, no Tartiflette! Reblochon is a Savoyard cheese made from unpasteurised milk, certified as a PDO or “Protected Designation of Origin”. It is therefore overseen by strict official specifications which must be rigorously followed. This certification applies to products whose manufacturing stages are carried out according to recognised ancestral know-how. This ensures the consumer is offered only the best, owing to the crafting of a controlled, monitored product of superior quality. As you’ve already guessed, Reblochon is a Savoyard cheese. Its name comes from the term “re-blocher” literally meaning “to milk a second time”. In the XVIIth century, the milk for Reblochon was produced through a second milking of the cows. It was therefore richer and creamier than that first milking, which is what gives Reblochon de Savoie its traditionally creamy texture. To find out more about the history of Reblochon, don’t hesitate to click on the button below. But let’s now get back to our cows! Which ingredients are needed to make a good home-made Tartiflette? We can already see you heading for it, and it’s a big NO-NO! Out with that horrid “Tartiflette cheese”, that grated cheese or any other cheese. Also forget about pre-cooked or vacuum-packed potatoes, olive oil, butter and other fats and oils, except for full-cream crème fraîche which adds to the mixture’s creaminess. And some lardons and onions. You can add a smidgen of Savoyard white wine for the taste (a good Apremont, Chignin, or Roussette for example) and a dash of full-cream crème fraiche to enhance the dish’s creaminess. A dash of pepper or even a sprinkling of grated nutmeg adds depth of flavour to the dish. As an aside, for an even more delicious Tartiflette, we recommend that you brown the potatoes with the lardons without adding any oils or fats! This makes them creamier and more flavoursome. However, you can cook them in water if you prefer. It’s a matter of taste. That’s the aside, there’s nothing more to it. Yes, that’s it, that’s all you need. Then, it’s into the stove, to be baked at 200°C for 15 to 20 minutes for a Tartiflette with a golden Reblochon topping. You’re guaranteed to enjoy the dish prepared this way. Tartiflette is so delicious, you’ll crave it at all times. So, your spirits aren’t starting to flag, are they? Still with us? In any case, those who’ve stuck around certainly won’t be disappointed. Red Label Reblochon Tartiflette! You can find it in the fresh or frozen section of your local supermarket. This product means no more excuses, a few seconds in the microwave or oven, and you’re done! Treat yourself to a Tartiflette with an authentic Savoyard taste. Interestingly, Red Label is a hallmark guaranteeing the consumer products of superior quality. In fact, any Red Label product is governed by official product specifications, established by the French National Institute of Origin and Quality. 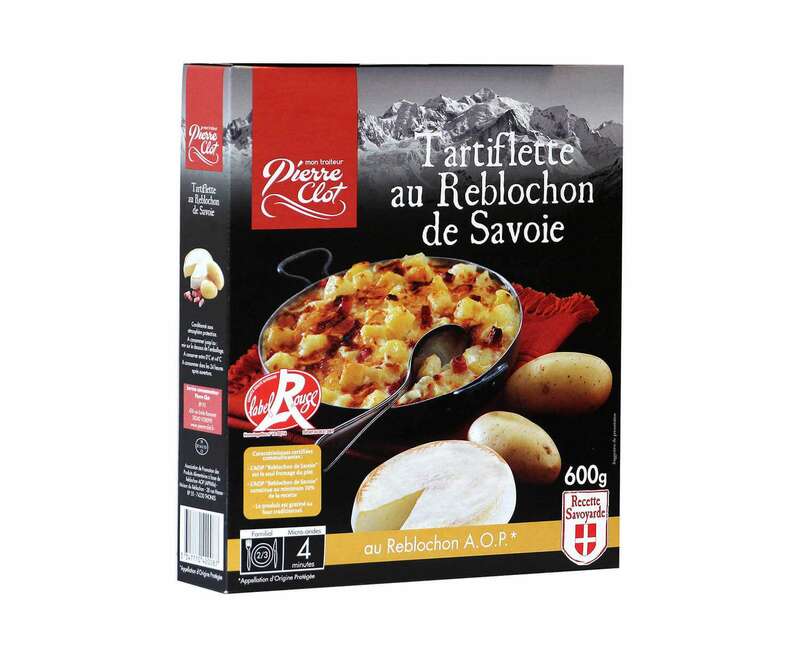 The official labelling of the Reblochon Tartiflette in 2014 put an end to a long reign of dishes prepared without the use of PDO Reblochon de Savoie. 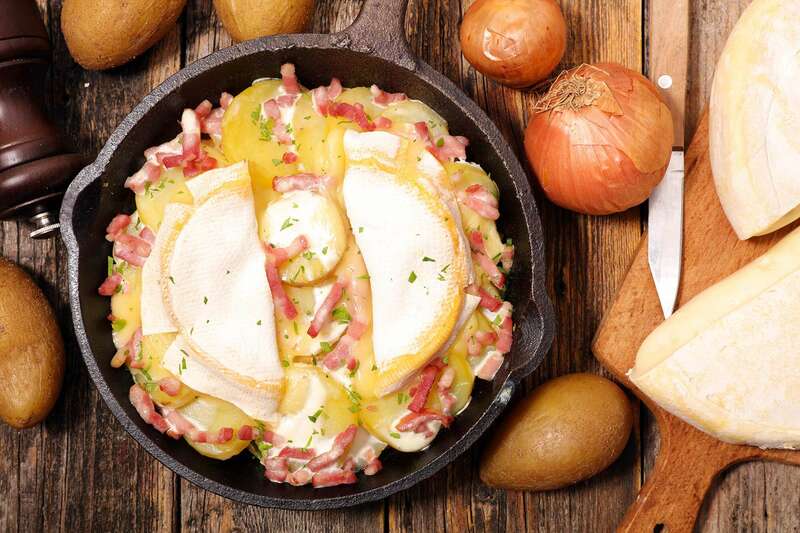 The Red Label Reblochon Tartiflette is a heavenly combination of potatoes, cream, lardons, onions and PDO Reblochon that remains true to tradition. Reblochon must comprise at least 20% of the recipe, and it must be the only cheese contained in the dish. Grilling in a traditional oven remains a key step in preparing this famous winter dish. The Red Label products appearing on our fresh or frozen shelves, manufacturing and packaging now meet specific criteria all to the benefit of their taste. Red Label Reblochon Tartiflette comes in individual or family-size portions. The Pierre CLOT brand already stocks the Red Label version in its fresh sections, and store brands are also ready to display this hallmark of premium quality.